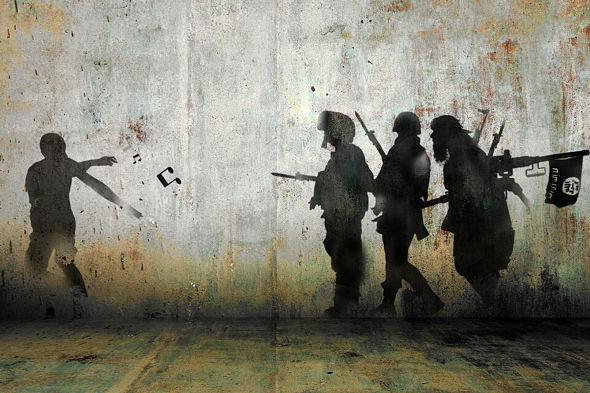 In the early days of the Syrian uprising, civil society came alive for the first time in generations. There is a lot of destruction, but it is still alive, says Daniel Adamson. In December 2011, a group of Syrian activists released 2,000 ping-pong balls onto a very steep slope in Damascus. On each ball was one word: freedom. The activists were with Freedom Syria Days – a group of many other revolutionary groups who were shocked by the beginning of the war in Syria. They were desperate to keep the nonviolence of the first months of the uprising. They were sure that action by the people would stop Assad’s regime, so they had a general strike, closed shops and stopped some transport. They put glue on credit cards and put them in ATMs. They put red dye in the fountains of Damascus. This was serious. The activists knew that Syrians had been tortured and killed for this type of creative resistance. But they didn’t know that, while they were releasing the ping-pong balls down the slope, Assad was releasing Islamist militants from Syria’s jails. The regime tried to hide this as part of a general amnesty. They said it was part of some ‘reforms’. But many analysts believe that Assad really wanted to change the civil uprising into an Islamist rebellion. This would make it OK for them to stop the revolution, and would stop the US from wanting to change Assad's government. 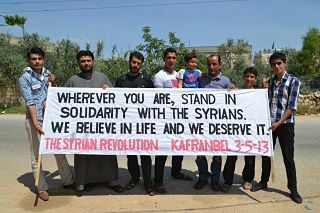 It took a long time for the revolutionaries in Syria to start fighting. It took longer for the Islamist militia to overcome them. But in the end, it was Assad releasing those prisoners, the army attacking peaceful demonstrators and the interference of foreign government that made sure Syria had a full civil war. In 2013, the Sunni jihadist movement became ISIS, a group that was even more dangerous. Assad was probably very happy when he saw that the West was getting scared. He had always said he and Syria were fighting terrorists and fanaticism. In 2014, with 200,000 people dead and the country destroyed, this was starting to sound possible. It was a desperate plan to destroy Syria. But Assad did this because he was more frightened of a non-violent uprising from groups like the ping-pong activists. He really didn’t want the people to stop being afraid. For 40 years, fear had kept Syria silent and stopped its imagination. Fear kept Assad’s Syria in one piece. Now, under the pressure of the uprising, the people were losing their fear. All the new energy grew into a new civil society. This had never been allowed in Syria before. The people who had marched for freedom now ran hospitals and schools, wrote about violations and news. Some joined local councils. Others set up projects to train journalists or treat children with trauma. These projects often had to close because of fighting, or because they didn’t have enough money or experience. But the revolutionary movement showed the courage of the Syrian people. Maybe the saddest part of Syria’s war was Assad’s attacks on this new civil society. In towns controlled by the rebels, Assad bombed schools and hospitals and killed thousands of civilians and made millions homeless. In places controlled by Assad, the security services arrested people who were too independent eg. web developers like Basel Khartabil (who campaigned for the freedom of information online); lawyers like Khalil Ma’touk (who defended Syria’s prisoners of conscience); humanitarians like Raed al-Tawil (who volunteered with the Red Crescent in Damascus). All three men went to prison in 2012 and disappeared. Al-Tawil was later released, but no-one has seen Ma’touk and Khartabil since. No-one knows how many more people are in prison with them - maybe as many as 150,000 – and it is very difficult to imagine their suffering. In 2014, a forensic photographer left the Syrian military with 55,000 images on flash drives. And the world saw for the first time what happens in these prisons. The photos showed about 11,000 dead bodies. They looked starved, beaten, showing cigarette and acid burns, electrocution, fingernail extractions, strangulation and stabbings. The arrest of so many lawyers, journalists and doctors has taken away some of the people who could have helped most the creation of a more humane and open society. Many others have escaped Syria. The optimism of 2011 and 2012 has been destroyed by so much destruction. The media has helped tell Assad’s story of the war against terrorists because it hasn’t reported what these activists are doing, and because it is fascinated by ISIS. Assad’s story says there are no democrats in Syria and Syrians are passive victims in the fight between Islamists and autocrats. It is hard to imagine how negative this must seem to the activists. No-one now thinks it is possible for a stable democracy to suddenly begin. Half the country’s people have no homes, thousands have suffered and will probably never fully recover, and a whole generation has trauma. Children are growing up with no schools in the refugee camps along Syria’s borders. But we must support the men and women who are still fighting to keep alive the hopes at the start of the uprising. The international community is still ignoring these people – this means they have no solidarity, little money and training, and no important voice at the international negotiations on Syria’s future. The September 2015 New Internationalist wants to show some of the best and bravest revolutionaries in Syria. We only have space for a few examples – thousands more will be unknown. Many of them agree, when asked what the international community can do to help: Syrians need an internationally enforced No-Fly Zone to protect them from Assad’s barrel bombs. Also the activists show so much humanity, creativity, and imagination - an important part of the Syrian revolution from its first day. ‘The Syrian people,’ wrote journalist Mazen Darwish in a letter taken secretly from a prison in Damascus, ‘are children of life, capable of constructing a state based on dignity, freedom and justice.’ All these writers and interviewees here show that. Together, they show that it is very wrong to suggest that the Syrian people would be happy to live under ISIS or a dictator. NOW READ THE ORIGINAL: http://newint.org/features/special/2015/09/01/sept-keynote-syria-resilient-revolution/ (This article has been simplified so the words, text structure and quotes may have been changed). This page was last edited on 6 September 2015, at 17:59.